David R. Humble got the idea as he stood in a long grocery checkout line in south Florida in 1984. The customer in front of him was so frustrated by the clerk’s slowness that he grabbed his own items and started scanning. “Why can’t anyone check himself out of a store,” Dave thought as he returned to his job as vice resident of product development for Sensormatic Electronics Corp. After convincing senior management that the idea was sound and tinkering with a number of prototypes, CheckRobot, Inc. was formed as a Sensormatic subsidiary with Humble as president. The rest, as they say, is history. In the intervening twenty years, self-checkout has evolved from a simple idea into one of the hottest technological innovations in retail. Self-checkout systems provide the necessary hardware, software, and support that give retail store customers the freedom to complete their own point-of-sale (POS) transactions. After selecting their merchandise, the self-checkout process allows customers to scan the barcodes to update the store’s POSdatabase, deactivate anti-theft tags if necessary, bag the items, pay for them with cash, debit, or credit cards, generate a receipt, and walk out the door without ever coming into contact with a clerk. The process itself may seem simple, but several sophisticated technologies must be seamlessly integrated in order for the checkout to proceed quickly and accurately without any other human intervention. Of primary concern is the accuracy of all aspects of the POS transaction. After decades of use, bar-codeprinting and scanning is highly accurate, relatively inexpensive to deploy, and “idiot proof.” The same can be said of the computer system interfacing between scanning equipment and the retail transaction processing software. Several fairly large hurdles had to be jumped in order for the American public to embrace the idea of doing all the work and still having to pay for the merchandise. The first was to condition customers to assume the burden of extra labor. Gasoline stations began offering self-service pumps in the late ixties with the inducement of a discount in the price per gallon of fuel. After awhile, people became accustomed to do-it-yourself gas pumping, and now it is difficult to find a full-service station. The second hurdle was figuring out how to handle the money and credit cards. Here, the growth of sophisticated vending machines and ATMs paved the way. Successful self-checkout relies upon a completely automated payment tendering method. Customers must be able to deposit cash and receive correct change, or swipe their credit or debit card and not worry whether or not an error will occur somewhere in the process. Now, the appropriate technology exists to consummate transactions more accurately than with a clerk. Automatic cash handling machines rarely make mistakes counting out change. Self-checkout systems require more security safeguards than manned lanes. Without them, thieves could simply load up and walk out of the store with impunity. The latest self-checkout systems have been designed to accommodate and enhance all of the existing loss prevention methodologies, such as electronic article surveillance (EAS), closed-circuit television (cCTV) and POS exception-reporting software. EAS deactivation occurs as the items are scanned, and video surveillance and recording activities can be undertaken as if the lanes were manned. But these features may not be sufficient to deter would be shoplifters in a situation where they may not be observed closely by a sales associate. Early in the development process, self-checkout manufacturers were concerned that the equipment should be able to somehow discriminate between every item, so that someone couldn’t scan a cheap item and place an expensive one in the bag. Developers came up with two possible solutions— weights and measurements. The idea was to measure or weigh every single stock-keeping unit (SKU), and compare the scanned item to the database to see whether or not it was “correct” within certain statistical limits. CheckRobot’s early units had a large box covering a conveyor belt, not unlike the luggage scanning portals used by airport security personnel. Laser beams were strategically positioned inside the box to try to measure the outer dimensions of the scanned items. If a “fit” occurred, the belt continued to move. If the item’s size didn’t match the database, the belt stopped, reversed itself, and sent the item back to the customer for a rescan. While measurement may have been a good idea in theory, in practice it simply slowed down transaction productivity and raised customers’ blood pressure, so the practice was not widely adopted. The current solution to this problem is a sophisticated weight-learning database software program that is constantly running in the background. “A consumer product’s weight isa stable attribute, particularly in the supermarket and drug industry,” says Dusty Lutz, NCR Corporation’s product line director for its successful FastLane self-checkout solution. “Weight-learning database software corroborates items quickly and transparently to the customer. It is designed to allow retailers to easily update the system with either new or discontinued items,” Lutz adds. As items are scanned and placed in the bag well of the system, an internal scale tracks additional weight and queries the database for corroboration. If no item is bagged, or if an item’s weight doesn’t match up to the database, the system prompts the customer to seek assistance from the attendant. Probably the most interesting security feature is the software integration enabling the attendant to monitor every scan at every self-checkout station. Envision a screen plitter that is common to CCTV monitoring. Instead of video, the screen splits the transactions on each self-checkout unit. This allows the attendant to look first at the customer to see what is being scanned, then look on the screen to corroborate the POS information. This adds another measure of protection against bar-code switching or non-scanning activities. Since the original designs for self-checkout came from a retail security equipment manufacturer, inventory shortage implications were anticipated, and security measures were built-in. While self-checkout is widely viewed as technology to improve the customers’ shopping experience, retail loss prevention executives have been able to insist upon the appropriate safeguards against shoplifting and fraudulent scanning. In researching this article, I asked a number of them whether there has been any noticeable impact, either good or bad, on inventory shortage or POS transaction fraud. While none of the respondents would allow any actual data to be published, all of them emphasized that in their experience the systems must be properly managed or else shrink would increase. They also noted that shortage levels tended to mirror demographic profiles in general—high shortage locations remained so after the introduction of self-checkout, and low shortage stores were not adversely impacted. Has there been an increase, decrease, or no change in the loss of goods (shrinkage) since the implementation of self-checkout? Five respondents reported a decrease in loss, while the other nine reported no change. None reported an increase. These retailers ranged in size from 20 to 2,200 stores and had experience with self-checkout ranging from pilots to 80 percent saturation. Over half of the respondents had used self-checkout for at least two years. The original manufacturers of self-checkout equipment were predominantly systems integrators who designed original equipment such as scanners, developed the weight-learning algorithms, and then worked with computer, conveyor, and scale makers to put together the system. After the idea got traction, the retail POS equipment providers decided to enter the business directly, and some of the pioneer companies were acquired. Now, and for the foreseeable future, the “big three” of self-checkout are NCR, IBM, and Fujitsu, together accounting for about 96 percent of the market share. These companies supply the vast majority of POS hardware and software systems, so it will be difficult for a fledgling company to effectively compete in mainstream retail. NCR has been manufacturing its own equipment for a number of years, and its FastLane system is the key product. A number of well-known retailers are using FastLane, including Albertson’s, The Home Depot, and Wal-Mart in the U.S, Tesco and Marks & Spencer in the United Kingdom, and Germany’s largest do-it-yourself chain, Praktiker. To date, Tesco has installed NCR self-checkout in 236 stores, and plans to add an additional twenty stores in 2006. Tesco management acknowledged that over one million customers use the self-checkout system per week. IBM acquired the Productivity Solutions, Inc. (PSI) system and intellectual property in late 2003. PSI had acquired CheckRobot years previously. Its customers include Food Lion, Wal-Mart, and Germany’s METRO Group. In early December, 2005, IBM announced its next generation of self-checkout systems with improved ergonomics and consumer-friendly cash management systems. Fujitsu is the latest entrant, having purchased the very successful self-checkout business of Montreal-based Optimal Robotics, Inc. in 2004. 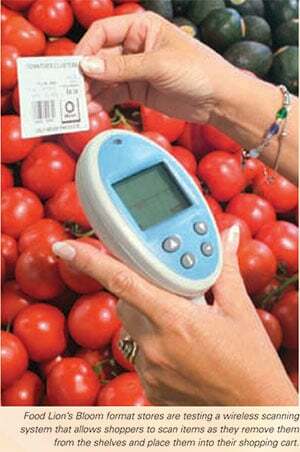 Fujitsu’s U-Scan customers are primarily in the grocery industry and include Kroger, Harris Teeter, Pathmark, and HEB. Researchers at IHL Consulting Group point out that there were over 34,000 self-checkout lanes in operation at the end of 2003, and the number will increase to in excess of 200,000 by 2007 . . . a stunning growth rate, to say the least. According to the Food Marketing Institute (FMI), almost half of U.S. supermarket chains now use self-checkout, which is up from only 6 percent in 1999. Some chains are fairly well saturated with equipment. Albertson’s has been rolling out its program for about four years and has installed over 4,200 units in about 1,100 stores. Mass merchants like Wal-Mart and Kmart have also introduced the concept, although Kmart subsequently removed it. In the drugstore business, California-based Long’s Drugs is involved in testing a prescription drug vending kiosk, and the other leading drugstore chains are considering the same thing. How Do Retailers and Consumers Like It? According to IDC’s 2004 follow-up study entitled “Self-Checkout Systems: Creating Value across the Retail Store,” consumers are willing participants in self-checkout, and the high adoption rate is meeting or exceeding retailers’ expectations. The study polled six retailers doing business in seven different countries that have had self-checkout systems in place for at least six months. Results showed 25 to 50 percent of all transactions were flowing through self-checkout, and consumers’ attitudes about the experience are quite positive. One retailer noted an 85 percent acceptance rate. Additionally, self-checkout is enabling retailers to redeploy staff to other areas in order to increase sales and customer satisfaction. “Retailers see improved service as the key benefit. Others include increased transaction throughput, increased customer loyalty, and improved customer service throughout the store,” noted the study’s authors. Results are so good, that four of the six polled retailers plan to at least double installations in the next twelve months. In addition to questioning user retailers, the authors conducted 6,359 telephone interviews with consumers in the U.S., Canada, U.K, Germany, Italy, and Australia. About 300interviews were conducted with Japanese consumers as they exited retail stores. These consumers cited faster checkout, shorter lines, and the opportunity to choose the method of checkout as the major benefits. Retailers that have deployed self-checkout are looking to reallocate staff to other areas of the store for improved customer service. Which of the following areas are mostimportant to you when you shop? Seventy-seven percent of the respondents wished to see staff reallocated to ensure the store’s cleanliness and tidy appearance. About the same number (77 percent) wanted better-stocked shelves, and 70 percent wanted more easily accessible staff to answer questions or find products. IHL’s new study, published in August, 2005, also polled consumers about their self-checkout preferences. Researchers note that there is a 94 percent correlation between the use of airline check-in kiosks and retail self-checkout. Once someone is comfortable using kiosk technology, new opportunities will be embraced rather than avoided. When asked which retail markets should install self-checkout in the future, 52 percent of the respondents identified drugstores. Is Self-Checkout only for Supermarkets? Supermarkets provided the laboratory for the original design and development of self-checkout. As a result, most of today’s features and functions tend to support the operational characteristics of big box retail and front-end checkout. Chains favoring conveyor-based checkout lanes and counter scanners dominate the list of users. The do-it-yourself (DIY) category has also understood the benefits. Home Depot is well into a deployment, and Lowe’s and Praktiker are starting rollouts. In the mass merchandising area, it is interesting to note that Kmart was first to deploy self-checkout, but the system has been removed. Wal-Mart is deploying rapidly, but Target Corporation has publicly stated it is not interested at this time. Sophisticated self-checkout equipment is relatively expensive. Aside from equipment costs, retailers must pay for the integration into existing POS and payment systems. Economic returns are derived from space savings and labor redeployment, leading to increased transaction throughput and more sales. It is unlikely that stores with a relatively low transaction frequency, like furniture, apparel specialty, or department stores, would benefit sufficiently from a large-scale self-checkout deployment. Food Lion is a member of Brussels-based Delhaize Group. It is one of the largest supermarket chains in the U.S. with over 1,220 stores in eleven Southeastern and Middle AtlanticStates. They first tested self-checkout equipment manufactured by PSI in 1999, and currently use it in eighty-three stores. The average Food Lion has eight checkout lanes, and self-checkout is employed in three lanes. The original units included conveyor belts that emulated the look and feel of a normal checkout lane. Current units utilize a bag well instead of a conveyor. Food Lion takes advantage of the weight-learning algorithm to minimize improper scanning, and also employs CCTV in the self-scanning area. Additionally, they have written a software modification to allow for the acceptance of discount coupons. At present, Food Lion plans to continue to deploy self-checkout in specific areas according to customer preferences. The Home Depot began piloting NCR’s FastLane self-checkout in twelve stores toward the end of 2002. Currently, the technology can be found in over 1,200 stores. Four self-checkout systems take the space of three traditional checkout aisles and eliminate the need for two cashiers. Home Depot deploys them to the floor to restock shelves or sell big-ticket items. One cashier stays to help customers with the automated checkout terminals. In its most recent quarterly results announcements, Home Depot attributed some of its financial success to self-checkout. In the quarter ending October 30, 2005, the average sale rose 6 percent to $58.92, which is up from $54.89 in January 2005 and $51.15 in January 2004. Wal-Mart uses both NCR and IBM self-checkout systems in more than 1,500 stores in four different countries. In a Wal-Mart Supercenter eight self-checkout lanes are employed—four in general merchandise and four in the grocery department. For a standard store, four systems are installed. Wal-Mart employs the weight-learning algorithm, and uses CCTV in the area. Like Food Lion, Wal-Mart has introduced some special provisions for the use of coupons. Four self-checkouts fit in the same space as two manned lanes. A single staffer can supervise all four lanes. The self-checkout equipment manufacturers realize that maximum penetration will occur only when the systems become more adaptable and affordable to other retail formats. Here’s a look at just a few of the more interesting products that are new to the marketplace. Hand-Held Scanning System. Several retailers, including Albertson’s and Food Lion’s Bloom format stores, are testing a wireless scanning system that allows shoppers to scan items as they remove them from the shelves and place them into their shopping cart. After completing the item selection process, the shopper bags the groceries and pays via cash or credit card. The system also reminds customers about items they may have forgotten. Store executives can closely watch customers’ buying habits. The information is used to target particular customers for promotions and to track store inventories. The Stop & Shop Supermarket Company has taken the wireless idea to an advanced level by announcing plans to roll out its “Shopping Buddy” developed by Cuesol, a Massachusetts-based integrator of shopping solutions and a key IBM partner. This new technology gives shoppers the power of an Internet computer at their fingertips, allowing them to both save time and take advantage of a number of new personalized services, such as notification when a favorite item is on sale as the shopper approaches in the aisle. Self-Checkout in a Coffee Shop. The Café at McElroy’s on the campus of Boston College lets its customers do everything except brew the coffee. New self-service machines allow students to place an order, pour their own drink, put money into the machine, and walk away with the coffee and a receipt. “The new self-serve machines have definitely positively impacted productivity,” says Erika O’Bannon, student supervisor at the café. Checking into a Hotel. Hyatt Hotels recently announced its intention to add self-service check-in and checkout kiosks to more than 100 of its hotels in the Regency and Grand Hyatt brands. Hyatt will be the first hotel company to offer the service throughout North America and the Caribbean. Based upon the methods used by airlines for flight checkin,the system allows customers to complete the entire process, including room key dispensing. Guided-Selling Kiosk. Germany’s METRO Group is installing IBM’s new Anyplace Kiosk as part of a guided-selling system designed to provide a wide range of product informationin an interactive format. Three of the kiosks are to be deployed in METRO’s Future Store in Rheinberg, Germany. Kiosks of this type are being used for unattended check-in at a few hotels, and for self-ordering in restaurants. Self-service has come a long way since the introduction of America’s first gumball vending machine in 1888. Vending machines soon offered everything from postcards to cigarettesand books. A completely coin-operated restaurant, world-famous Horn & Hardart’s, opened in Philadelphia in 1902. The first ATM was installed in a New York bank in 1969. 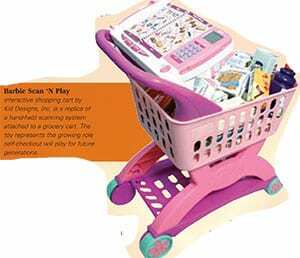 Perhaps the best proof that Dave Humble’s idea for grocery self-checkout will eventually dominate mainstream retail is demonstrated by a child’s toy called Barbie Scan ‘N Play, which is a full-blown replica of a hand-held scanning system attached to a grocery cart. The message to the child is clear—technology is fun. Embrace it at a young age, because you’ll be using it for the rest of your life.